Tecan offers a wide range of disposable tips for use with the Liquid Handling (LiHa) Arm for the Freedom EVO® series instruments. Tecan LiHa Disposable Tips are carefully designed, produced and validated to ensure reliable liquid handling performance, and this premium tip quality is a prerequisite for reliable operation, minimal downtime and optimal productivity of Freedom EVO workstations. LiHa Disposable Tips are available in a variety of tip volumes, with or without filters, and are made of conductive polypropylene to allow capacitive liquid level detection. Three purity levels are available – Tecan Standard, Tecan Pure and Tecan Sterile – each tailored towards specific applications. 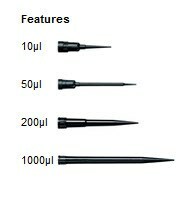 Tecan Standard tips are supplied in space-saving cardboard packaging. This purity level is particularly suited to applications such as ELISA, sample handling and biochemical screening. Tecan Pure tips are supplied in blister packaging. Target applications include genomics research, forensics and molecular diagnostics. There are no threads in Tecan LiHa - Liquid Handling Disposable Tips Reviews at this time.